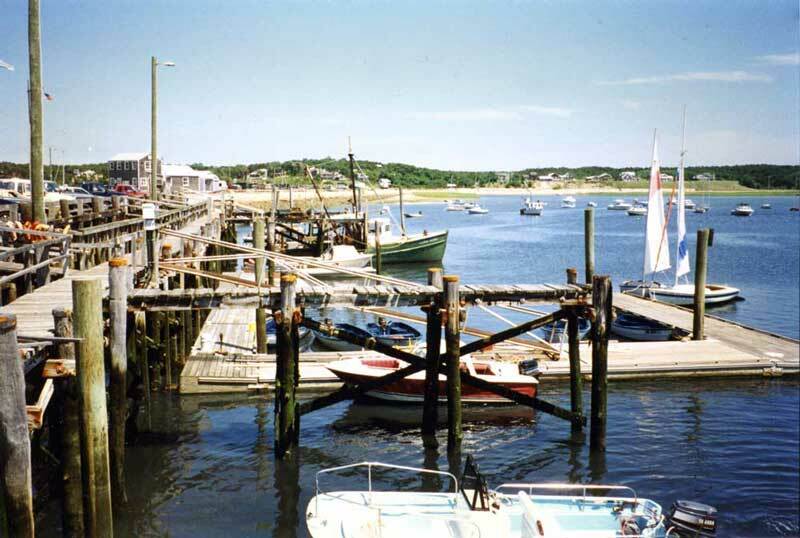 These Docks are part of the town pier in Wellfleet on Cape Cod in Massachusetts. I’ve been drawing in this area since the 1970’s. I remember thinking there was nothing left for me to draw and settling on this scene, which is an unusual one for me. I normally gravitate toward commercial boats, the more beat up the better, but all I could see here were well-kept rental boats and one commercial fishing boat in the background. The Naviator—a boat that does tourist fishing trips - was out at the time, which was just as well because it would have dominated the background. The end result surprised me by becoming one of my favorite drawings. The biggest challenge was making sure that when I stopped drawing for the day the drawing was in a state of completion. I’ve been in situations where I return in the afternoon and the tide is very high or all the boats are gone or some other unfair thing that happens when you draw moveable things has occurred. The first big drawing I ever did was in St. Jean de Luz in the south of France on the Atlantic coast. I tried to draw the whole port from our tiny balcony. The last night we were there I decided the drawing was finished. When I looked out in the morning every single boat had either moved or was being towed to another part of the harbor. I try to learn from experience so I always keep boat drawings finished, until I make them more finished. 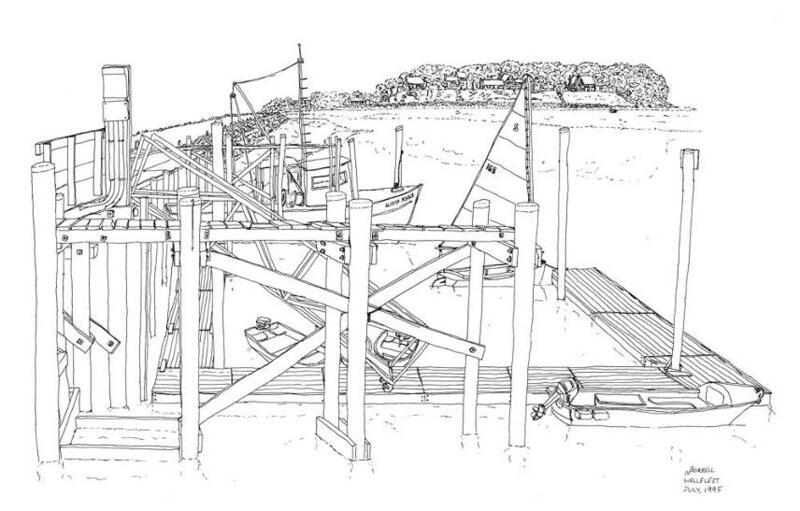 One time we rented one of the houses in the background of the drawing, on the other side of the harbor. It took about a half hour to walk into Wellfleet, but it was fun. First down the hill, then a walk along the beach that eventually involved an ancient railroad embankment and finally across Uncle Tim’s Bridge. We had rented there hoping to have our own little piece of harbor where we could swim any time we wanted. We did, for a very short time. There was a bluefish feeding frenzy on the second day we were there. A mass of bluefish attacks schools of smaller fish from below. The smaller fish try so hard to get away from the fierce bluefish that they actually jump up out of the water only to fall back in and get chomped by the blues. The day after the feeding frenzy we went out on our beach to find it littered with dead fish. Most of them had one bite taken out. That’s when we went back to swimming in the ocean, the bay beach and the kettle ponds. I was on Town Pier with Amy and Adam one day about a week later and we witnessed another feeding frenzy. There were fishermen all over pulling in fish after fish since the blues were biting at everything in the water. One guy on the beach asked if anyone wanted a fish and I yelled back that I did. We all loved grilled bluefish. He reeled one in, laid it on the sand and hit it hard with a bat until it stopped moving. Bluefish have very sharp teeth and bite ferociously. He took the hook out and held the fish up to me by the tail. Luckily we had driven over, so I took the bluefish and put it in the trunk of our rental car. We drove to the house to show Gerry our “catch.” As we were driving over the fish revived and started flopping around in the trunk. When we got to the house I told Amy and Adam to go inside and I got a big cast iron frying pan from the kitchen. I opened the trunk and gave the fish a couple of hefty whacks. When it stopped moving for the second time, I took it inside and we had a lovely dinner. Gerry’s mother came up to stay for a couple of days and decided the perfect thing would be to rent a boat and take a cruise around. I like to draw boats, but I’ve never had much luck driving them. I finally gave in and rented one of the little motor boats in the drawing. We all got in and puttered around for awhile. My memory of the cruise involves me getting us stuck in seaweed over and over again. Luckily it was always shallow water and I could use one of the oars that were in the boat to get us out of the weeds. This is more my speed, someone else driving the boat. 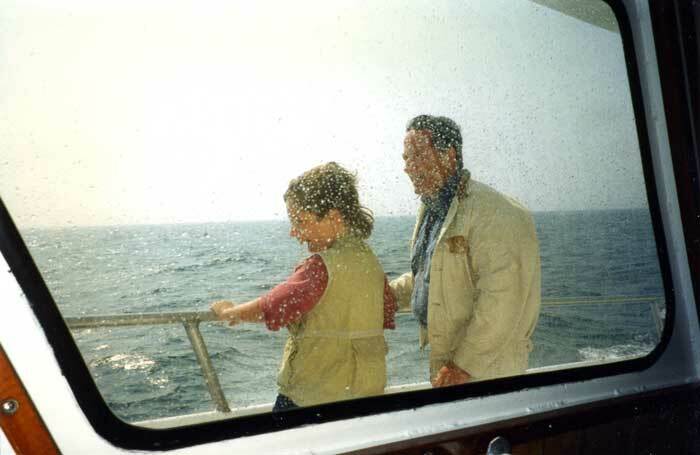 We used to go on a Whale Watch every year but haven’t been on one in a while.